Splash Mansion — Beautiful, private five bedroom log home with amazing views of the Smokies. This cabin rental has one of the BEST VIEWS IN ALL OF GATLINBURG! This Gatlinburg cabin has premium king beds, large game room, kids’ rock climbing wall, oversized hot tub, indoor swimming pool, & so much more! Book your family reunion here today. Skinny Dippin’ — This log cabin has a wraparound porch just walking distance to the Parkway or Little Pigeon River. You are less than 2 miles to Dollywood & could walk to the trolley easily. The game room features multiple games & wifi internet access. Enjoy the indoor pool, hot tub, & gas grill here in Pigeon Forge. The location is so convenient for family vacations or romantic getaways! 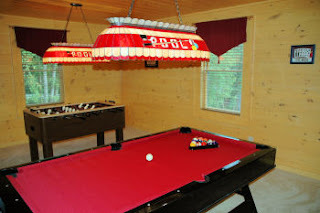 Gone Swimming — This vacation cabin rental is extremely popular because of its game room with bunk beds, air hockey, foosball, & pool table! You can supervise the kids in the indoor pool from the living room windows too! 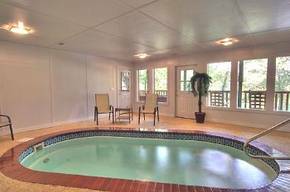 This log cabin with indoor pool has a custom built kitchen & small creek behind the cabin for visual pleasure! Cool Waters — This cabin rental has outdoor pool access, plus a small indoor splash pool. The curb appeal of this home is amazing, just 1 mile up from the Gatlinburg Visitor Center. This Chalet Village log home has sauna, jacuzzi, & pool table for entertainment purposes! It’s like a Resort just minutes from Downtown Gatlinburg. A perfect getaway cabin rental in the Smokies! Book any of these cabins while availability exists. Aunt Bug’s Cabin Rentals is the premier leader in swimming pool cabins here in the Smoky Mountains. Your kids or spouse will be very excited to hear you booked a wonderful cabin rental with indoor private pool and fun games, to boot! The excellent locations of our cabin rentals also make these desirable vacation homes. 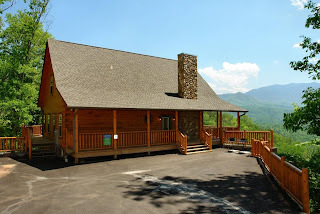 The next time you want to make a big Splash in the Smokies, check out these featured cabin rentals at Aunt Bug’s Cabin Rentals.